It’s been a busy last 24 hours for Rock Health — and last three years for that matter. Today, the San Francisco-based accelerator for digital health startups held its fifth Demo Day at UCSF’s Genentech Hall. Pitching their ideas to a crowded room full of investors and entrepreneurs, the ten companies in Rock Health’s latest collectively offered a vivid cross-section of the pain points and opportunities within our evolving (and beleaguered) healthcare system. From CancerIQ, which is harnessing Big Data to offer more personalized care to cancer patients, and Lift Labs’ stabilization tools for those suffering from motion disorders — like Parkinson’s — to Spire, which offers a wearable monitor aimed at reducing stress, Rock Health’s fifth class is a represent of many of the broader, prevailing trends in healthcare. Big Data solutions, data analytics and security, wearable technology (like Augmedix’s Google Glass interface for doctors), cost and risk management, smart mobile interfaces and hardware were all on hand — and topics that received plenty of airtime during the course of the day. The roster of investors on hand and the fact that many of the startup’s founders have come to Rock Health from more traditional companies and verticals within the tech industry, are further proof of the growing interest in digital health and healthcare. With the arrival of Obamacare this fall, the FDA releasing its final guidance on mobile health applications this week and the changes to regulations and compliance (as illustrated by AWS), the landscape is evolving fast. Access to technologies and infrastructure that has previously eluded HealthTech entrepreneurs is on the rise. Rock Health itself is a testament to how much the space has changed already. 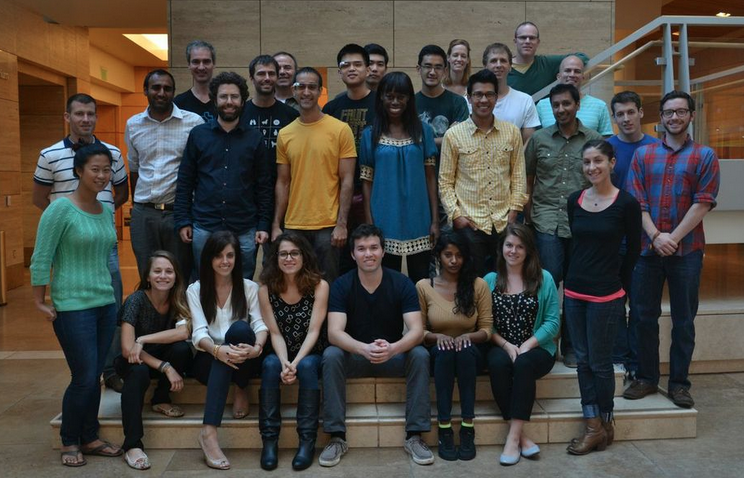 It’s hard to believe that the accelerator is already launching its fifth batch and is already three-years-old. Since launching in 2010, Rock Health has become one of the largest health-centric business accelerators out there and has secured corporate partnerships with G.E. and Qualcomm, medical partnerships with Kaiser and the Mayo Clinic and venture backing from Kleiner Perkins, NEA and many others. These strategic relationships have enabled the accelerator to offer its startups valuable guidance and business development opportunities (and beta testers) and significantly increase the amount of seed capital it offers to founding teams. What’s more, one of the primary functions of a business incubator (especially in this space) is to not only connect its startups with potential strategic partners, but to help them secure critical early capital from outside investors that will help them combat the relatively low levels of early-stage investment in digital health (compared to other industries). The examples given today from Rock Health’s fifth batch show the progress it’s been able to make on this front, as Spire has already raised $1 million and has launched pilots with large employers, including LinkedIn. Lift Labs has secured $1 million in funding as well and is taking orders for its first “Liftware” stabilization product. While the majority of the fifth batch is still in the relatively early stages of fundraising, Tecco tells us that the batch has collectively managed to secure $5.5 million in follow-on funding, with more on the way. 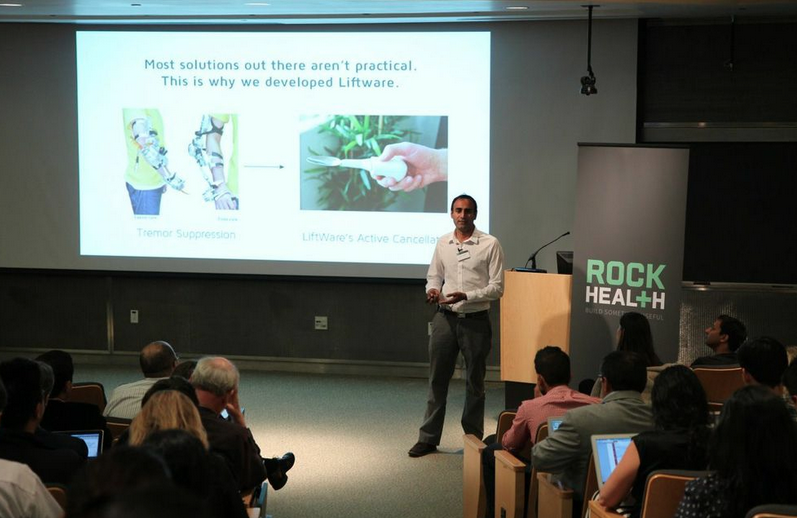 As fundraising activity ramps up for its startups, Rock Health has been busy as well. In conjunction with Demo Day, the company today unveiled a new, totally-redesigned website and announced that it is in the final stages of preparation for a move that will see it take up residence in new office space. In a move slated for November, Rock Health is planning to relocate from its current Chinatown digs to the ground floor of a research building in the Mission Bay District — part of its larger plans to expand both its operations and its team. In talking about the institutional, legislative and regulatory changes contributing to the ongoing transformation of healthcare, the traditional perception of healthcare has been that it is an opaque, closed and extremely challenging market to tackle. Part of the reason it has been so resistant to change and has rebuffed so many entrepreneurs over the years. But because of new rules instituted by the SEC, we’re beginning to see the removal of barriers that have kept a lid on the tech ecosystem at large as well as the healthcare space. But regulatory hurdles and costs are beginning to be torn down, and a new level of accessibility is beginning to appear that will bring a whole new level of participation and activity in these markets. In other words, thanks to the SEC lifting the 80-year ban on “general solicitation,” startups can now publicly advertise the fact that they’re raising money, and broadcast their efforts to accredited investors. Capitalizing on these regulatory changes, Rock Health today announced that it has struck a partnership with AngelList that will, for the first time, create a special fund through which accredited investors can put an equal amount of capital into each startup from its fifth batch. Tecco says that the fund will accept as many as 100 accredited investors, allowing them to invest in all of its graduates at once — at a $10 million cap — equally in a convertible note. In addition, Rock Health is only accepting applications online, through AngelList. While the experiment has just begun, this could represent a huge opportunity within the digital health ecosystem, for both investors and startups. It gives entrepreneurs increased access to capital, without having to jump through the hoops traditionally associated with fundraising and, at least in the case of Rock Health’s new fund, could be a great deal for investors. Amplify Health — Giving at-risk providers the tools to proactively manage their patients and reduce avoidable healthcare costs. Anapsis — A research platform and marketplace for scientific and statistical computing. Augmedix — A service for Google Glass that enables clinicians to focus on what matters most: Caring for patients. CancerIQ — Harnessing big data to scale personalized cancer care. CRIXlabs — Building software for de-risking drug development. Lift Labs — A startup building active stabilization tools for people living with tremor. Sensentia — Automating complex healthcare administration tasks that until now required human intervention. Smart Patients — An online community for cancer patients and their caregivers. Spire — A next-generation wearable for productivity and wellbeing. ThriveOn — Delivering mental health on-demand.